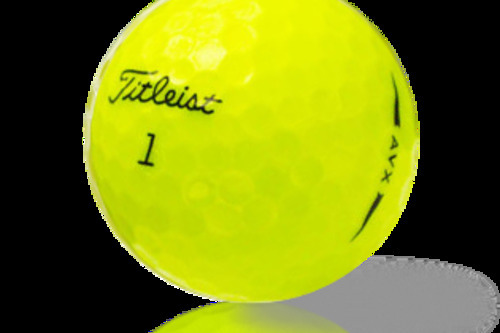 12 Titleist AVX Yellow AAAA/Near Mint Grade just $33.99, save $6.00! 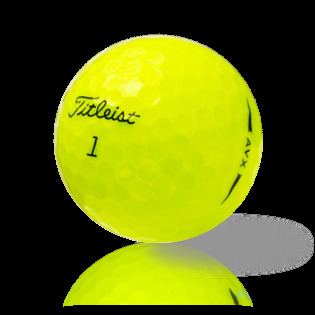 Titleist AVX Yellow are a current model ball selling in pro shops all around the country for up to $74.95 a dozen. Save huge dollars by purchasing from Lost Golf Balls. Titleist AVX Yellow are featured in pretty much every pro shop around the country. The press and uptake of these golf balls is huge. They offer incredible distance with that great soft feel that all golfers love. The Titleist AVX Yellow have a low piercing ball flight as well as low iron spin, these features help you hit longer, straight shots. On approach to the green, touch and feel are not sacrificed and you will be able to get the grab, touch and feel required for better scoring. Titleist AVX Yellow are constructed with Titleist's unique 352 tetrahedral dimple design. Titleist AVX Yellow are one of the most hyped golf balls in the game, try them out from Lost Golf Balls at a bargain price.